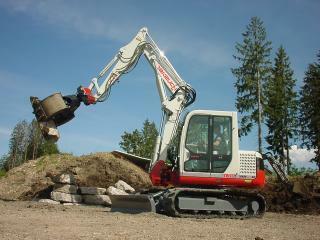 Takeuchi is the manufacturer of the crawler excavator model TB 175 CV. Find and download detailed specs and data sheets for this machine here. The Takeuchi TB 175 CV is a 7.6t machine with Yanmar engine which powers this model with up to 43.5kW or 58 horse power. This Takeuchi crawler excavator belongs to the smallest machine segment in the crawler excavators category. The TB 175 CV’s size is 2.15m x 6.55m x 2.57m. The bucket capacity of TB 175 CV is 0.25m³, which is above average for this type of machine. The TB 175 CV is manufactured and distributed with Overload alert. Material Handling Excavator, Diesel particulate filter and Blade are not provided on this model as of 2004. There are more detailed specifications and machine descriptions available in the original Takeuchi TB 175 CV specs data sheet. Specification sheet is available for a free download in German and English - providing the machine descriptions and more detailed specs about this particular model. This model can be acquired for a list price between €102000 and €129000. Production of the TB 175 CV stopped in 2004. For more detailed information about pricing and current residual values, check out the LECTURA Valuation system. At present, 4 other crawler excavators, which range from 8.4t up to 14.8t are produced by Takeuchi. Of these, TB 290 CV, TB 290 CM and also TB 280 FR are the most frequently visited on LECTURA Specs. Want more detailed specifications? Download the latest Takeuchi TB 175 CV specs data sheet on LECTURA Specs today!